Seven-Card Stud High-Low Split doesn’t normally make the headlines as part of a major championship series, but all eyes will be on Event #15 when the remaining 19 players return to decide the WSOP bracelet today. Adam Friedman leads the $5000 buy-in Seven-Card Stud High-Low Split World Championship tournament but ominously looming into view are eight-time WSOP champion Phil Ivey and 11-time winner Phil Hellmuth (along with Bryn Kenney, Todd Brunson, Marco Johnson and Eli Elezra). The winner will take home USD $269,037. • Brian Hastings, an online poker legend now living in Ft. Lauderdale, Florida (while jetting to Canada and the Bahamas to ply his trade), won Event #12, the $10,000 buy-in Heads-Up No-Limit Hold’em World Championship. 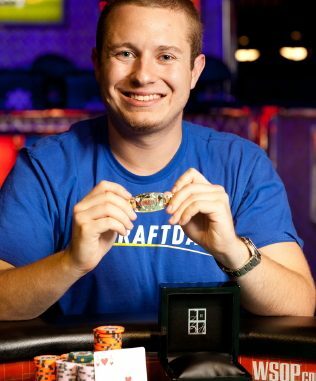 He collected his first gold bracelet and a payout of USD $371,498. Hastings’ ultimate victory demanded that he win seven consecutive heads-up matches that were randomly drawn in a bracket format. Hastings (pictured left) defeated Jason Mo, a 24-year-old poker pro from St. Louis, in the last heads-up match of the bracket. The top 32 finishers from a starting field of 152 entrants collected prize money. 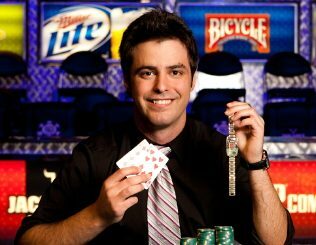 Former gold bracelet winners who made the money were two-time champ Brock Parker, who made the final four. Vanessa Selbst, another former winner, made the round of 16, as did Antonio “The Magician” Esfandiari. 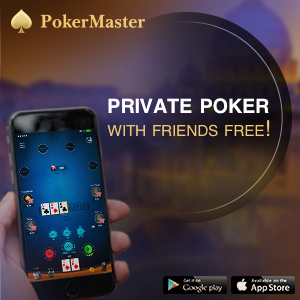 • David Arsht, aka "Doctor Dave," a 66-year-old physician from the Philadelphia area scored a big upset in winning the $1500 buy-in Limit Hold’em title, collecting USD $211,921 in prize money. The semi-retired urologist swept by a field 730 entrants to claim a famous victory. 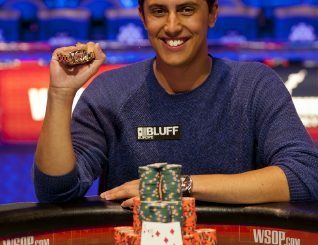 One of the more notable in-the-money finishers included Roland Israelashvili, who is among the leaders in combined WSOP and WSOP Circuit cashes over the past five seasons. The Russian-born New Yorker, who took 10th in this tournament, now has 21 WSOP cashes to go along with 26 visit to the pay window in WSOP Circuit events. 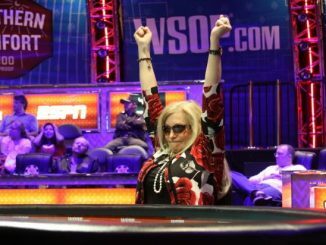 Among the former gold bracelet winners in the money were Jennifer Harmon-Traniello (18th) who collected her 27th cash (fourth all-time among female players). Humberto Brenes, Costa Rica’s most famous poker player, took 35th place – good for cash number 64 which ranks fifth all-time. Men “The Master” Nguyen hit the money for the third time at this year’s WSOP – which means he’s picked up one step on all-time cashes leader Phil Hellmuth (who’s cashed twice, to date). Nonetheless, Nguyen (with 75 career cashes) is still a heavy underdog to draw even or surpass Hellmuth, now sitting comfortably on 87. • Just 12 players remain in contention for the Event #14 ($1500 buy-in No Limit Hold’em Shootout) title. There are 12 players remaining, with Layne Flack the chip leader and players including Jeff Madsen, Brandon Steven, and Brandon Schaefer still in contention for the gold and first prize of USD $311,174. Event #16, the $1500 buy-in Six-Handed No Limit Hold’em tournament continues with 137 players back to contest day two meaning more than 90 per cent of the starting field of 1604 were eliminated. Nick Maimone is the chip leader with Mike “The Mouth” Matusow, Tristan Wade, Tony Dunst, Adam Junglen, Kathy Liebert and James Akenhead. In the lead-up to a massive weekend at the Rio, two more events kick-off today – the $10,000 buy-in Pot Limit Hold’em World Championships and $2500 buy-in Seven-Card Razz.